Subhash Chandra Bose (January 23, 1897 – August 18, 1945? ), also known as Netaji, was one of the most prominent leaders of the Indian Independence Movement against the British Raj. Subhas Chandra Bose was born to an affluent family in Cuttack, Orissa. His father, Janakinath Bose, was a public prosecutor who believed in orthodox nationalism, and later became a member of the Bengal Legislative Council. His mother was Prabhavati Bose, a remarkable example of Indian womanhood. Bose was educated at Cambridge University. In 1920, Bose took the Indian Civil Service entrance examination and was placed second. However, he resigned from the prestigious Indian Civil Service in April 1921 despite his high ranking in the merit list, and went on to become an active member of India’s independence movement. He joined the Indian National Congress, and was particularly active in its youth wing. Subhas Chandra Bose felt that young militant groups could be molded into a military arm of the freedom movement and used to further the cause. Gandhiji opposed this ideology because it directly conflicted with his policy of ahimsa (non-violence). The British Government in India perceived Subhas as a potential source of danger and had him arrested without any charge on October 25, 1924. He was sent to Alipore Jail, Calcutta and in January 25, 1925 transferred to Mandalay, Burma. He was released from Mandalay in May, 1927 due to his ill health. Upon return to Calcutta, Subhas was elected President of the Bengal Congress Committee on October 27, 1927. Subhas was one of the few politicians who sought and worked towards Hindu-Muslim unity on the basis of respect of each community’s rights. Subhas, being a man of ideals, believed in independence from the social evil of religious discord. In January 1930 Subhas was arrested while leading a procession condemning imprisonment of revolutionaries. He was offered bail on condition that he signs a bond to refrain from all political activities, which he refused. As a result he was sentenced to a year’s imprisonment. On his release from jail, Subhas was sworn in as Mayor of the Calcutta Corporation. In 1931 the split between Gandhiji and Subhas crystallized. Although the two never saw eye to eye on their view of freedom and the movement itself, Subhas felt that Gandhiji had done a great disservice to the movement by agreeing to take part in the Second Round Table Conference. Subhas viewed freedom as an absolute necessity, unlike the freedom which Gandhiji was “negotiating” with the British. Subhas was arrested again while returning from Bombay to Calcutta, and imprisoned in several jails outside West Bengal in fear of an uprising. His health once again deteriorated and the medical facilities diagnosed him with tuberculosis. It was recommended that he be sent to Switzerland for treatment. Realizing that his avenues abroad were greater with the restrictions of the British, Subhas set sail for Europe on February 23, 1933. Subhas stayed in various parts of Europe from March 1993 to March 1936 making contacts with Indian revolutionaries and European socialists supporting India’s Struggle for Independence. Subhas met Mussolini in Italy and made Vienna his headquarters. Subhas was opposed to the racial theory of Nazism but appreciated its organizational strength and discipline. On March 27, 1936 he sailed for Bombay and but was escorted to jail immediately after disembarking. After lying low for a year, he was able to work actively. He attended the All India Congress Committee Session in Calcutta, the first one he attended after a lapse of nearly six years. Time had healed the tensions between Subhas and Gandhiji, and Gandhiji supported Subhas in his efforts to become the President of the next Congress session, 1938. He went to England for a month in 1938 and rallied for the Indian freedom cause amongst Indian students and British labor leaders sympathetic toward India’s cause. It was a bold move since he was constantly under British surveillance. Upon his return to India in February 1938, Subhas was elected President of the Indian National Congress. An excerpt from his Presidential address read, “I have no doubt in my mind that our chief national problems relating to the eradication of poverty, illiteracy and disease and the scientific production and distribution can be tackled only along socialistic lines… .” Subhas emphasized that political freedom alone would not be sufficient, as the ills of the British reign would continue to haunt post-Independent India. He stressed the need to solve linguistic and religious prejudices and to achieve a high literacy rate amongst Indians. Gandhiji found Subhas’s ideologies far too leftist and strongly disagreed with Subhas’s criticism of village industries and stress on competing with the rest of the world in the Industrial age. Opposition from Sardar Vallabhai Patel, lack of support from Gandhiji and Nehru’s indecision marked Subhas’s year as the President of the Congress. One of Subhas’ major contributions was setting up of a National Planning Committee, for the development of an economic program running parallel to the national movement. Differences between Gandhiji and Subhas led to a crisis when Gandhiji opposed Subhas’ idea that the Bengal Government (a coalition between the Krishak Praja Party & Muslim League) be ousted and the Congress take charge in coalition with the Krishak party. The idea was criticized by Gandhiji and Nehru, which resulted in the strengthening of the Muslim League in Bengal and ultimately partition of India. It is obvious today that had Subhas been able to carry out his plans, Bengal would be a different entity on the atlas. Despite opposition from the Congress brass, Subhas was a favorite amongst the majority as he was re-elected for a second term in March 1939. Gandhiji considered Subhas’s victory as his personal defeat and went on a fast to rally the members of the Working Committee to resign. Subhas resigned and Dr. Rajendra Prasad assumed the Presidency of the Congress. In May 1939, Subhas formed the Forward Bloc within the Congress as an umbrella organization of the left forces within the Congress. Gandhiji and his supporters accused Subhas of breach of Congress party discipline and drafted a resolution removing Subhas from the Congress Working Committee and restrained him from holding any office for three years. On September 3, 1939 Subhas was informed that war had broken out between Britain and Germany. Subhas discussed the idea of an underground struggle against the British with members of the Forward Bloc. Subhas pressurized the Congress leaders to get a Declaration of War Aims from the Viceroy; he declined. Subhas was elected President of the West Bengal Provincial Congress. In December the Congress Working Committee subverted the Provincial Committee’s authority and appointed its own ad hoc committee. The Forward Bloc progressively became militant and by April 1940 most of its senior members were arrested. Subhas was convinced that the only way he could bring about India’s Independence was by leaving the country and fighting from foreign territories. He had made contact with radical Punjab and Pathan activists who had contacts in Afghanistan and Russia to organize a militia. Subhas knew that Britain was in a vulnerable position following the surrender of France in June 1940. He announced the launch of Siraj-ud-daula Day on July 3, in memory of the last king of Bengal who was defeated by Clive. His plan was to hold a procession and to unify Hindu and Muslim nationalists. The Government interceded and imprisoned Subhas on July 2, 1940 in Presidency Jail, Calcutta. Netaji believed that foreign assistance was a must to free India from British rule. In 1939, when the Second World War broke out, Subhas sought assistance from Germany, Italy, and Japan as they were enemies of Britain and thus would be natural allies. In 1941, he evaded a house-arrest in Calcutta by disguising himself as a Maulavi and going to Kabul, Afghanistan. Later, he procured an Italian passport and fled to Berlin, Germany. 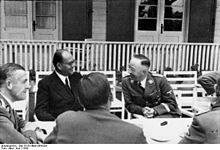 There he met Hitler and discussed his plans and sought his assistance to free India. He also sought assistance from Mussolini. From time to time, he aired his speeches on the Azad Hind Radio from Berlin to communicate his intentions to fellow Indians and to prove that he was still alive. After the defeat of Germany, Netaji realized that he could not continue his struggle from Germany anymore. Ultimately, Netaji reached Japan in June, 1943. 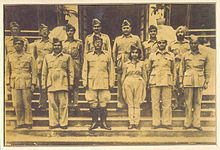 He established the Indian National Army (INA) with some 30,000 Indian soldiers. He also set up a radio network in South East Asia in order to appeal to the people, both in India and outside, for support. The INA declared war against Britain and America. However, the INA had to retreat from the Indo-Burmese border after a heavy defeat of the Japanese troops there. The British defense was impenetrable. Though the “Delhi Chalo” mission failed, Netaji proved to the world that his determination was strong and his attitude was positive in his dream to free India from the clutches of the British. Find out where Netaji Subhash Chandra Bose was hiding all these years. See the video of Bose at Nehru’s funeral, which causes an uproar in Indian parliament and Britain.